The Finance Minister described it as a “red letter day” while Howlin said that after years of intensive discussion, the bailout officials had steadily become “friends of Ireland”. Ministers Howlin and Noonan at the Department of Finance this morning. MICHAEL NOONAN WELCOMED the conclusion of the twelfth and final troika review of Ireland’s bailout programme this morning, saying that “enormous progress” had been made over the last three years. Describing it as a “red letter day” for the country, the Finance Minister also said that the measures taken as part of the programme had been “difficult and very hard on the Irish people at all levels of society”. Acknowledging the EU/IMF officials’ efforts on Ireland’s behalf, Noonan said today’s conclusion of their final mission here flew in the face of some of the worst predictions that were made when the bailout was first announced. 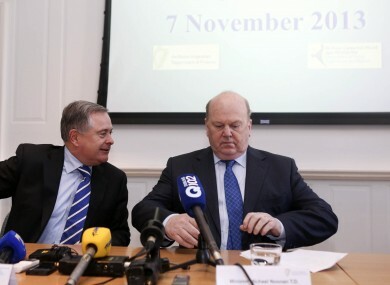 “A lot of people predicted this would never happen and that we’d be mired in bailouts indefinitely,” Noonan said. The Minister said the country remained on course to exit the scheme on 15 December and make a full return to the markets. On the subject of whether he’d be making use of a further precautionary line of credit, Noonan said the Government would be moving on “to making a decision on the best methodology for exit”. Public Expenditure Minister Brendan Howlin said the officials had been “happy to sign off” as “they believe we’re in a robust state; that the mistakes that were made that plunged us into the economic mess have been largely addressed”. Asked about their personal working relationships with the troika team, Noonan said that he found them to be “very effective people”. “They kind of became honourary Irish people after a while. “They were very committed to getting us out of the difficulties we were in. Howlin said there had been “a lot of intensive discussion” during the review process. “I suppose discordant words were exchanged, some differences of understanding happened over that period, but by-and-large all three elements of the troika became strong friends of Ireland, and within their institutions became advocates for Ireland — explaining what was happening here to people who were a little bit more distant they were”. The Minister said however he was “glad to end the business communication” and looked forward to meeting the officials in the future in “less formal” circumstances. Email “After 12 reviews and at least a few "discordant words," Noonan and Howlin bid farewell to the troika”. Feedback on “After 12 reviews and at least a few "discordant words," Noonan and Howlin bid farewell to the troika”.